I think it’s becoming obvious that these articles won’t be technical in nature, but they are still aimed at us Consultant-types, including Architects and Project Managers, but also equally support and ‘in-house IT’ will also benefit. In the previous article we looked at what a Framework was, and how SOF kind-of squeezes itself into that category of things. Now we can have a look at what makes up SOF, how it breaks down into stages and phases, and what each of those means (or rather, prescribes for you). Now, if you have ever successfully deployed more than one IT product or delivered more than one IT-based service, you WILL have adhered to a Framework, whether it’s an officially recognised one, or just went rogue and worked your own way – your own personal Framework. There’s even a Framework for making a cup of tea, or meeting somebody at the pub. Each of those activities can be done differently by different people, but the fundamentals remain the same. It’s just that nobody in their right mind (sorry Project Managers) thinks of those activities as adhering to any sort of established or agreed frameworks, but they do. If you follow SOF to the letter, will your Skype for Business Online project be a success? Probably. If you don’t follow SOF does that mean your project will fail? Absolutely not. But credit where it’s due, if you have successfully delivered Skype for Business, then you’ve more than likely covered most of the actions that SOF dictates. I think what I’m trying to say is that it’s not necessarily a BIG jump from what you may already be doing… it just has that unmistakable Microsoft twist. Where do we start, usually the beginning, and luckily there is a clear entry point to SOF, but not so much a clear or defined end to a SOF engagement, similar to how ITIL includes a Continual Service Improvement stage which feeds into the next iteration of Strategy right back where you began, and that makes a lot of sense, each project does not exist in a vacuum, and you should never expect a brand new shiny product rolled-out in 2001 to stay in constantly in use and remain unchanged forever, there will be time when it needs to be upgraded, or replaced… How do you recognise that? By envisioning and assessing and the whole thing starts again. Microsoft present their Framework in a wheel, with three distinct stages, each stage contain several phases to create a simple two-level hierarchy. Despite not showing it as two-levels in the wheel… ignore the inner rings, and just accept they all come under the main headings in the outer ring. 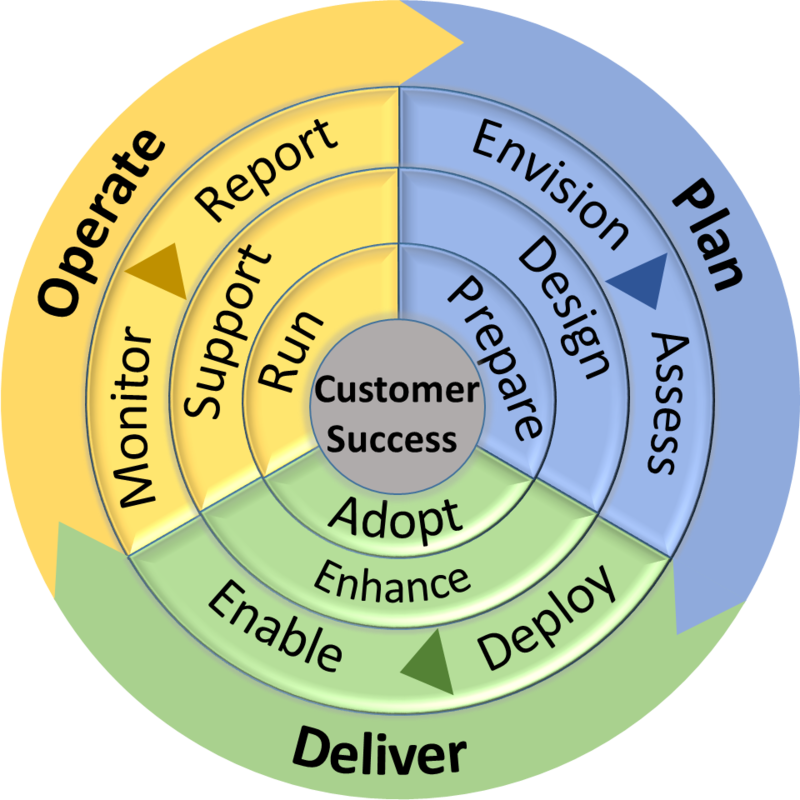 There are three stages – Plan, Deliver, and Operate; there’s not exactly a dove-tailing between Operate and Plan like there is between the others, but it’s somewhat implied in the diagram – and probably stems from ITIL or an equivalent Continual Service Improvement idea. This shouldn’t be a shock to anybody, a project without these steps, just isn’t a project. I’ll quickly go though a brief overview of each of these stages and the phases inside them now, but in the next articles I’ll cover one stage at a time and go into more detail on the actual steps (hmm, I might call those articles ‘Stepping SOFtly’ – catchy huh?) and I will also cover what documents are expected to come out of the workshops etc. Here comes the language barrier, under the Plan stage there are 4 phases – Envision, Assess, Design, and Prepare. How I understand it; Find out what the client/business wants, make sure they fully understand what they’re asking for. And cover how these new things will affect their business and users. One of the biggest issues with this is, not sure about you, but a Microsoft partner or a consultant is very rarely involved at this stage. This usually happens internally when the project is just a twinkle in somebody’s eye, before any business cases are presented, and before budgets have been set. It’s very difficult to go anywhere and ask them to revisit all that. But it’s also where a lot of expectations can be wrongly set; or new essential features may have been added after the project started, but before the client finally engages with a Microsoft Partner or contracting a Consultant, that the client just isn’t aware of. So perhaps it’s good to recap all this. Another concern I have is the last sentence, ‘incremental value to the business as part of the ongoing lifecycle’, and later on we see that ‘Envisioning’ pops up again… Now that just sounds like scope-creep to me. However, I do agree it’s important to be aware of the ‘evergreen’ world of Office 365 always changing as features come out of preview into GA, and how they fit into the original requirements – just be careful. This is where it starts to get more technical, and includes both Network Readiness Assessments, as well as Business Readiness Assessments. Network Readiness should be fairly obvious for most and even the classic and oh-so familiar Bandwidth Calculator spreadsheet rears it’s head along with some funky new tools. But this is also where the softer skills come in (sorry, should have said ‘SOFter skills’), you’ll notice some aspects of User Adoption (usually an afterthought in most organisations) start bubbling up to the front. Microsoft are recognising that if people (‘users’ are still people after all) don’t use it, or don’t want to use it – then the project will be a failure, wasting money and time. Working out what types of users there are, breaking that down into ‘Personas’ and figuring out their requirements so we can all makes their work lives better and easier, this should mean the bulk of the roll-out will be a welcoming sight for the vast majority of users (if only it was always that easy). It is important to realise that this Design phase, is not just a traditional solution design or technical design, but because SOF is primarily focused on Skype for Business Online, there may not be any on-premises hardware or servers at all. So ‘design’ is more likely to cover the approach, the plan, the run-books, and the operational processes that go with the actual migration to ensure once the project is underway, there is an already agreed way to handover to a business-as-usual or support team. hmm that’s odd… There’s not a prepare section in the SOF Asset Downloads, and there isn’t a ‘Prepare’ section on the website either… Although there are two Readiness sections!? Perhaps somebody had an empty slot in their wheel-diagram and had to write something down. So, for this section I guess that means you get a ‘study period’, some time off for you and your client to prepare yourself for the next stage of SOF. This is the implementation phase, where stuff gets done. 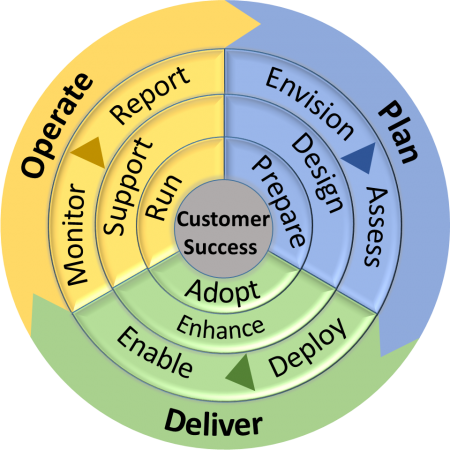 Separated into Deploy, Enable, Adopt, and Enhance phases. Ooh, there’s our Prepare stage! I sense that some re-ordering probably went on, but I’m guessing, like any good committee, MicroSOF had already agreed on the wheel-motif by that time, it is Version 2 now after all – I see somebody must have been reading John C Maxwell’s “Failing Forward” book. Just get it out, and learn from any mistakes… Perhaps I’m being too picky, let’s move on. Prepare and Deploy – get the client and their environment ready, revisit the readiness assessments and do anything required to fix potential issues. Then get on with it, deploy, click those ‘next’ buttons (that sounds a bit dated now, perhaps it should be – assign those licences in the web portal – but that’s not as catchy) – note: deploy only covers up to the pilot phase – this is an important milestone and not to rush passed and throw everybody up to the cloud too quickly. We need to ensure that the process is sound, and testing is properly considered. There is some very good material in this section, specifically around QoS, and Split Tunnel VPN (they even use bold fonts) – those can be two of the most challenging topics to get across to the client.. “we have plenty of bandwidth, we don’t need QoS”, or “Everything else works over our VPN, why is Skype for Business any different, actually before you continue – let’s bring our Security Officer into this meeting – he used to work for Avaya on their IP Office product, and that requires a VPN, so – explain yourself”. We now have a definitive “Microsoft said so… and here’s why” – a combination that always wins. Slight order change between the website and our favourite wheel-o-gram, this phase has also been renamed to ‘Develop Habitual Use’ in the downloadable package and website – but that wouldn’t fit in the wheel (I may be getting cynical in my old age – but I can’t think of anything I do habitually that’s good for me). Skype for Business Adoption Methodology and Success Framework – Where did that come from, so that’s SfBAMSF? – hmm, nah, I prefer SOF. Although you may not have recognised it up till now, but you can see things have come along way since RASK (Roll-out and Adoption Success Kit), and not only in name. SOF is RASK on Steroids (or SOFeroids – you can thank Marc B. for that one). There’s yet more Envisioning activities in this phase. Also some ready-made one-page A4 or foldable A5 quick-start guides (called Job Aides now) – memories of RASK flooding back. Oh dear, another missing chapter… Although there is a one-liner on the website that hints at this being a continual ‘Envisioning’ process to look at application and service updates to ‘enable new business benefits’. Perhaps this was merged into the ‘Adopt’ er I mean ‘Develop Habitual Use’ phase above. This stage is all about transferring the solution to the people or teams that will look after it long after you’re gone, starting from the initial user pilots. The majority of the stuff in these 4 phases are expected to be on-going activities. The order and names are a little mixed up again, but at least we’re 4-for-4 this time. This can be simplified by saying it’s basically using and understanding the Call Quality Dashboard, and monitoring any on-premises hybrid components and service health. This is all about reviewing the current usage statistics and comparing them against previous data, and tracking them against agreed targets. Another section with great content, focusing on troubleshooting and diagnostic tasks, there is a ‘guide’ document that covers common troubleshooting tips such as ‘Validating Connectivity’, capturing traces, using tools (Message Analyser, Netmon, Wireshark, Fiddler), validating configuration and media quality, using CLS Logger, and collecting common client data (OS and app versions, and client logs etc). Also known as ‘Manage Daily Operations’ if you’re rummaging through the downloadable assets or the website looking for information on the ‘run’ phase, that’s where you’ll find it. Aimed at Hybrid more, this section covers the regular maintenance activities required for the on-premises components including patching. Also in this section is a ‘task list’ to be carried out on regular intervals i.e. daily, weekly, and monthly. Daily tasks include checking media quality and top failure reports on CQD, checking backups, and incident management review of any on-going issues. Weekly tasks include attending change control meetings, more media quality (negative trends etc), and more incident management reviews. Monthly tasks contain numerous really detailed activities, this is turning into a full-time Skype for Business job for at least 1 person! – auditing network drivers on clients, audit of devices used, audit endpoint and client versions, auditing administrator access, updating CQD Building and Subnet data. And some higher-level items such as holding Stakeholder media quality reviews, and problem management reviews. Applying server patches for OS and Skype for Business, assess the need to upgrade Azure AD Connect, SQL Server patches, validate capacity of the environment… and finally “Validate Disaster Recovery Plan” – yes monthly! Until next-time… where I’ll jump back to the Plan stage, and go through the activities and outputs.